Although aluminium is an extremely resilient material, in certain circumstances when there has been exposure to moisture and the components have not been separated and allowed to dry, the product may become subject to unattractive staining. Although this discolourisation will not affect the strength or integrity of the product it can be aesthetically detrimental and make your install look less professional which, in turn, can impact on customer satisfaction. According to the Guidelines published by the Aluminum Association of America, there are several ways to minimise water staining of aluminium which we have summarised below, but first let's explain more about this reaction and why it occurs. 1. What is the cause of water staining? If water is present on aluminium and it becomes trapped between wraps, sheets or other packaging material with no air flow to remove it, the prolonged contact between the water and the metal causes a chemical reaction which results in water stain. This can present as white marks or dark staining and can happen in a relatively short time, so it is very important that you act immediately should you notice any moisture on or around your aluminium. 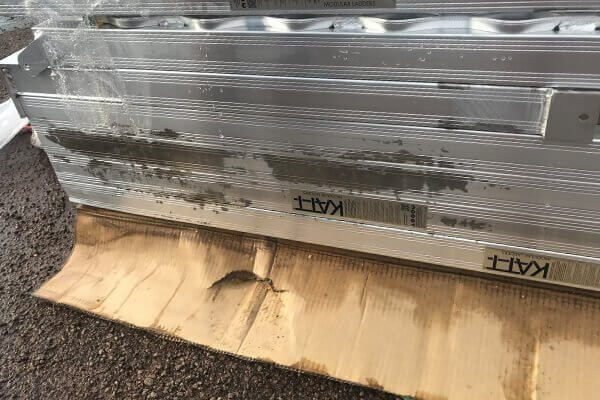 Condensation can also be a contributing factor and becomes present when aluminium is removed from a cool or cold storage area into a warm trailer or truck on a humid day. This can occur during any season of the year; however, for some areas it may be more pronounced in summer. Do not leave goods packaged and stored outdoors. 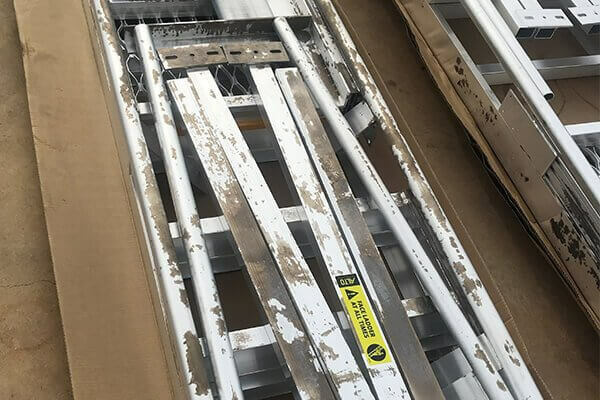 If goods need to be left outside for a time prior to install, we recommend goods are unpacked and separated on timber so no two pieces of aluminium are in contact allowing moisture staining. In storage, do not place aluminium with other metals. Use wood faced shelving, racks and bins. Store away from caustics, nitrates, phosphates and acids. Upon receipt of deliveries, materials should also be inspected for signs of wetness to avoid the possibility of water staining. This should include looking for wet packaging or pallets. Do not store aluminium near obvious water sources such as steam or water pipes, and keep it at a reasonable distance from open doors and windows. If the metal is received cold, allow it to come gradually to room temperature, which may take several days, before opening or breaching the packaging. Even a small opening can allow atmospheric moisture to condense on the material. 3. What if you notice your aluminium is in contact with water? If you notice moisture on the aluminium, it should be allowed to dry thoroughly before storage. This should be done by evaporation using dry air, if possible fans. Removal of the moisture will prevent stains occurring and halt the growth of any existing water stains. If at all possible, process the aluminium immediately and dry it as it is being used. If you are unfortunate enough to have water staining on your aluminium, we recommend using scotch brite heavy duty scour pads with clean water as a means of removal. Fortunately, if staining has occurred, and the moist condition causing it is removed, the stain will not continue to develop. 5. What is Sayfa doing to minimise water staining? As part of our duty of care to you, we have regular discussions with our freight contractors to ensure that our products are not allowed to get wet. Our goods are always transported in covered trucks and kept under shelter. Should you at any time receive wet goods please contact the sales team immediately on 1300 301 755 or sales@sayfa.com.au so that we can investigate the delivery and ensure that this situation does not reoccur.